Other than Good Friday, Ash Wednesday is probably the day on which children are least expected or planned for in the sanctuary. The prophet Joel, however, insists that parents bring their children to the meeting he has called to point out to the whole community that they are sinners. Today, there is much for children to learn from seeing their parents and the leaders of the congregation wearing ashen crosses and even more from wearing ashes themselves. The experience deeply binds them to their faith community. + The imposition of ashes is amazing to children. They marvel at the sight of adults wearing the ashes. At first they wear their own ashes as a sign that “I am one of them” or “I belong.” Over the years as they hear the language about sin, forgiveness and repentance, they begin to wear them as an admission that “yes, I too am a sinner.” This is not an easy step for children who are repeatedly told that they are wonderful and capable. It also flies in the face of all the adult insistence that they can make good choices which is often taken to mean “if you try hard enough, you won’t be a sinner.” Sharing in Ash Wednesday worship makes it easier to make the admission that “yes, I too am a sinner” by setting it in the presence of everyone else making the same admission. We are all first marked with the cross using water (and sometimes oil) at our baptisms. At that time to be marked with the cross is a wonderful thing. We are identified as the loved children of God. On Ash Wednesday we are marked with the cross using ashes and the words, “remember you are dust.” The ashes and words remind us that we are not so wonderful. In fact, we are all sinners. Fortunately the sign is not an X, marking us as hopeless rejects, but a cross reminding us that God loves and forgives us, sinners though we be. 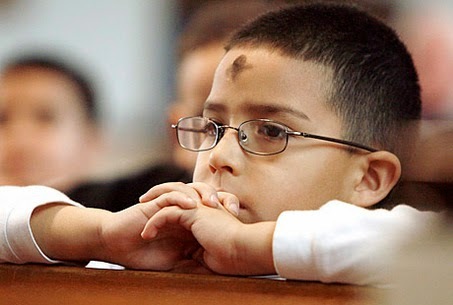 + In spite of their interest in the ashes, for children Ash Wednesday is mainly the beginning of Lent. Lent is for them spring training for disciples. We begin the season admitting to ourselves and others that we are not perfect disciples and are fortunate that God loves and forgives us anyway. We then commit to doing better. When children are offered specific doable disciplines that will help them be better pray-ers, better Bible readers, better at serving others, they respond enthusiastically. Having committed themselves to such disciple training, they come to communion as to the training table. Here they are reminded of God’s love of those who try and do well and also to those who try and do not do as well as they wish. 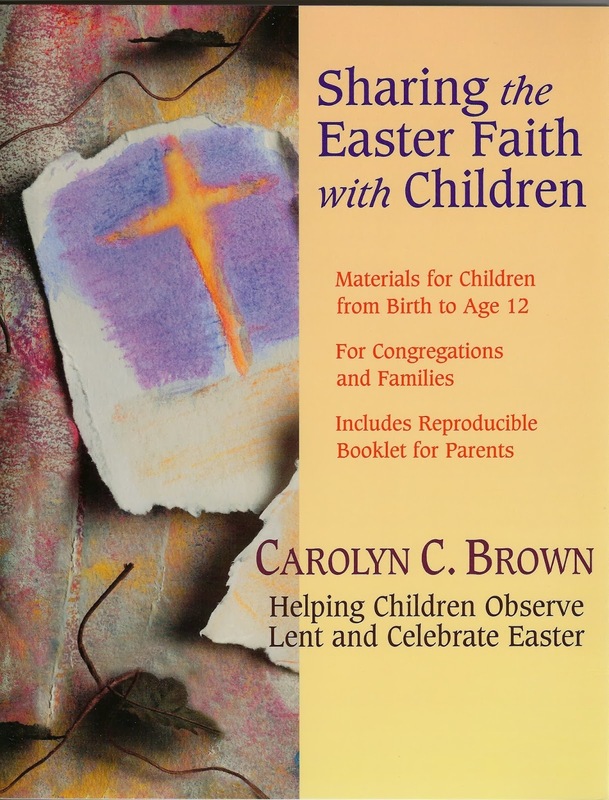 Go to Observing Lent and Celebrating Easter in Year A (2014) and scroll down the page to It's All About God's Stories This Year" for a suggestion about a story reading discipline for children and/or families for Year A. + Many congregations mark the beginning of Lent by changing the paraments and adding special crosses to the sanctuary. It is very appropriate to make these changes on Ash Wednesday. But, if the reality is that many will not be part of the Ash Wednesday service, consider stripping the sanctuary for that day leaving it somber and then adding the Lenten colors and symbols on the first Sunday of Lent when you can call the majority of the congregation to observe Lent. 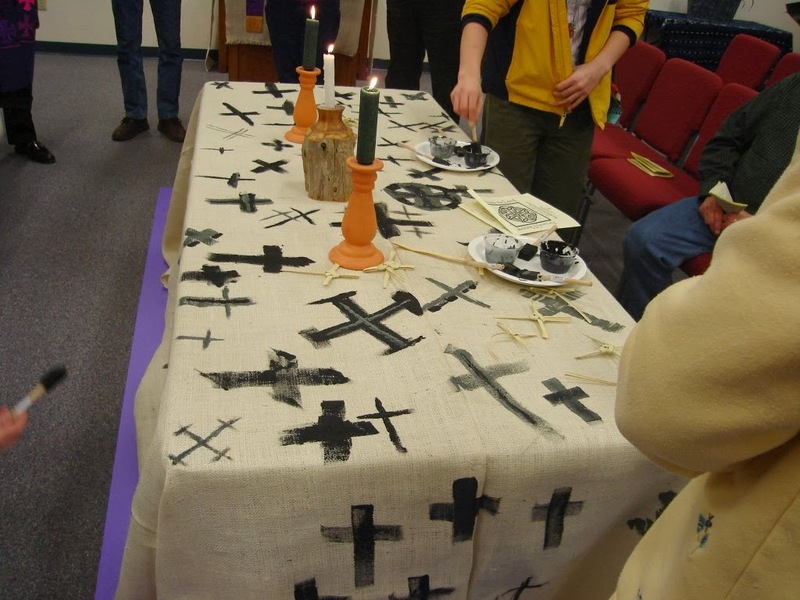 + Another way to set the sanctuary for Lent is to cover the Table or hang a large banner made of natural burlap that has been painted with black crosses. At Blue Ridge church last year, worshipers of all ages painted this one during the Ash Wednesday service. + In Sharing the Easter Faith With Children I offer detailed plans for 2 Ash Wednesday services. Neither is built on the lectionary readings for the day. One is a traditional sanctuary service built around the stories of Peter who had to repent frequently. It uses many traditional prayers selected with the presence of children in mind, a call to confession, the imposition of ashes, changing the paraments, introduction of Lenten disciplines, and communion. The second begins with a pancake supper at which soap crosses are carved or wooden crosses are sanded and rubbed with linseed oil. After supper people follow the tolling handbells to the sanctuary for a short service of stories about picking up crosses and following Jesus. + A reminder in the comments that children often assume the ashes are hot and will burn. They need assurance they will not. + Go to Bread not Stones: Remember You Are Dust to read an essay about how important Ash Wednesday can be to children. Don't miss Rebecca's idea in the comments about how to encourage children to come to the service. + Go to Fresh Worship - Ash Wednesday Service for a service centered around four tables that families visit to explore, experience, respond to different Ash Wednesday themes. Be sure to read the comments for ideas about how people adapted this plan. I was particularly caught by the possibility of simply setting out a series of stations for families to work through whenever they can get there during the day. This text can frighten children with its threat of God punishing people. Isaiah’s message with its call to change your ways is complicated, but gives children a way to respond other than simply be frightened. Incorporate Joel’s trumpet into the call to worship. sound the alarm on Zion, God’s sacred hill. Even newly married couples must leave their room and come. 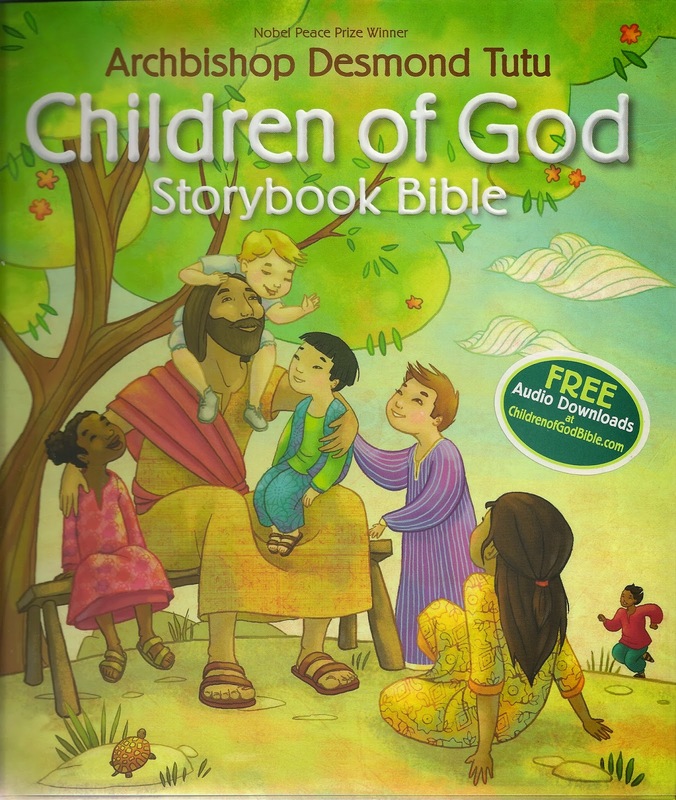 + Though this is a complicated passage, when it is explained to children, they respond. Isaiah is saying we don’t need to be sad about the bad things we do. Instead, we need to stop doing those things. We need to change our ways, to repent. Verses 6 and 7 are key. When they are explored and linked to specific Lenten disciplines offered to the congregation, children take them up enthusiastically. Encourage worshipers to make up their own fast - feast challenges and to undertake living by them during Lent. (This is based on a more adult list found at what the tide brings in being sure to read the comments for citing purposes. ) The worksheet below is one way to present this challenge to children. Urge them to post their papers somewhere in their room at home where they will see it often. + King David arranged for a man to be killed in battle (accidently on purpose) so that the King could marry his wife. Adult Bible students will know why David wanted to marry Bathsheba, but the murderous theft of a wife is significant in itself to grab the attention of worshipers of all ages. What do you pray to God after you do that? + Verses 1 -6 are descriptions of how sinful humans can be. They include lots of unfamiliar “sin” words –transgressions, iniquity, sin, evil, and guilty (NRSV). Write one or more of these words on a large sheet of poster paper in black crayon or dip your fingers in the ash pot and write them as you point them out. Briefly describe all the ways we hurt and sin against each other and God. Specifics help. Name calling, hitting to hurt, cutting someone out, teasing someone to hurt them, and telling a lie or a secret are familiar sins to children. Point out that we don’t like to admit we do these things, but that all of us do. Then note that on this day every year (and perhaps during each Sunday worship service), we take time to be honest with ourselves, with God and with each other about this. We are all sinners. + Verse 10, “Create in me a clean heart and put a new and right spirit within me” is an interesting word picture that has to be explored before children can grasp it. The literal picture is both odd and right on target. Children need to be told David did not want God to cut him open and wash off his heart. But, he did want God to help him “clean up his act.” He wanted God to give him a second chance or a fresh start and wanted God to help him do better. He wanted to repent. When we pray this prayer we join David. (Even though we haven’t done anything as bad as having someone killed, we have done lots of other hurtful, sinful things). If you have done the sin words poster, add REPENT in purple marker. For children on Ash Wednesday this is simply a call to repent now. Now, during Lent, is a good time to work on being better disciples. “Just do it!” They will not hear this as the passage is read, but depend on the worship leaders to restate the call in other ways during worship. This is another “just do it” message. Jesus says we should not make a show out of our Lenten disciplines. We don’t need to tell everyone we know and remind them of how good we are being by doing it. Instead we are to make it between us and God. Talk to God about it. Ask God to help us. Thank God for forgiving us when we fail. Tell God why we are doing it. Hi Carolyn, How did you all paint the banner during worship? Can you give me more details, please? Hmm, this was a service I attended at neighboring church. So, I can't send or refer to a filed plan. And, it may be worth noting that several years later, I can't remember exactly how it went. What I do remember is the quiet experience of a room full of folks thoughtfully painting crosses on a central table. The painting took place during rather than before the service. There were shallow paper bowls of dark gray and black paint with brushes laying on flat paper plates (so they couldn't flip onto the table). The scene was set for us before we were invited forward to paint. People of all ages participated quietly with music in the background. We were instructed to return to our seats when we were through and to pray quietly until everyone was through. It may have been done at the confession as a way to admit all we each do that make the cross needed. The paints were easily removed by worship leaders and the sacrament was served around that table. Worship was in the round on Ash Wednesday. The Table with the cross cloth was moved to "the front" for the Sundays of Lent. If you ask some of your detail questions, maybe you will jog my memory. Rats! It is dead and some good ideas with it. I'll leave the paragraph up on the chance that just the idea in the last sentence about leaving stations in place for families to visit as they can on Ash Wednesday will be all someone needs to start creating something wonderful. Hope they share what they create.